There are several buildings in Vienna that claim to be outstanding examples of Jugenstil, the Central European shade of Art Noveau. The church on the Zentralfriedhof cemetery, for example, or the one on the Steinhof mental hospital. The Secession, of course, and the Otto Wagner subway stations of the U4 and U6, as well as his houses on the Naschmarkt Wienzeile. Another building by Austria′s most famous Jugendstil architect is the Postsparkasse at the southern end of the Ringstraße. It makes a great starting point for a thorough Ringstraßen tour. You will find it to the opposite of the incredibly pompous K.K. Kriegsministerium ("Imperial and Royal Ministry of War") at the Stubenring. The Postsparkasse was the national headquarter of the banking branch of the Austrian Postal Services and opened in December 1906 as the "k.k. Postsparcassen-Amt". The design was groundbreaking in its innovative design and many people that understand a lot more of architecture than I do say that it is among the most important Austrian contributions to modern architecture. The building was erected in a brand new technique using steel grids and concrete - something one can see in pretty much any construction site in the World today, but this was revolutionary around 1900. The façade of the Postsparkasse is decorated with rectangular marble plates and aluminium - once again, something highly innovative: Back then, aluminium was not only a fairly new material, but also very expensive. Not the screws that hold the marble plates in place: They are part of the ornament, following the motto: "Form follows function". The construction of the Postsparkasse took two years, starting in 1904. Since then, it was in permanent use and survived World War II without damages. The interiors were partly modernised in more recent years and much of the original spirit is lost. Fortunately, though, the key basic impression one gets from entering the building is still the same as it was a century ago. This is because the flair of the inside comes from the light, which is smartly sent through the building by the use of glass tiles. Given the time when the Postsparkasse was designed, it is a truly remarkable piece: its plain simplicity and elegance in way resembles Art Deco more than the floral and ornamental Jugendstil of this time. I would blame Otto Wagner for just being a great architect - to me, he created the most remarkable and aesthetically pleasing building on the Ringstraße. In a strong contrast to the Kriegsministerium to its opposite, the Postsparkasse is almost humble or modest - something quite extraordinary in Vienna. It certainly proves that Otto Wagner was the most important Austrian contribution to Art Noveau. 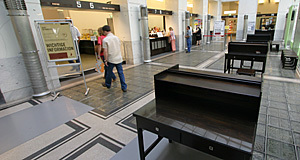 The central hall of the Postsparkasse is open to visitors during normal opening hours. In the main hall, exhibitions on modern architecture are regularly held.